Did you know that Greedy is one of the few smurfs that was regularly shown in the comics and also throughout the entire run of the cartoon series? This is most likely due to his good nature and love of food. Schleich first released Greedy in 1984, wearing a chef’s hat and white apron while sitting on a red stool eating a dessert with a spoon. In the beginning Schleich only released Greedy until 1986, then 1990 to 1994. It was given article number #20165. However, in the 2000’s Greedy had a revival being sold with various magazines and DVD’s in different countries. Greedy was also produced out of Hong Kong for Wallace Berrie in late 1983 and 1984. It appears that the same mould was used as the Schleich one but it was painted with slightly different paint colours. The most obvious difference between the two, is the brown paint used for the spoon & plate and the pink paint used for the dessert. At various times Greedy has been sold as a bonus figurine with either magazines or DVD’s. Each time, the same figurine was used and can be found with matte paint colours and is made out of a harder pvc material compared to the ones released in the 1980s. The markings can be located underneath: Made in China Schleich S Germany © 1983 Peyo CE. Here is a list I have compiled, that was sold using Greedy Smurf as a bonus figurine. Please let me know if there is something not quite right or if there any others I have missed. 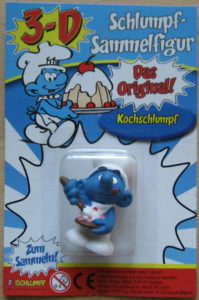 In France between 2004 to 2006, the magazine Je Collectionne les Schtroumpfs was sold with a bonus smurf figurine. Greedy was sold with their second edition of the magazine. In Germany in 2008, the magazine 3-D Schlumpf Mag was sold with a Greedy figurine. This issue was released around June. 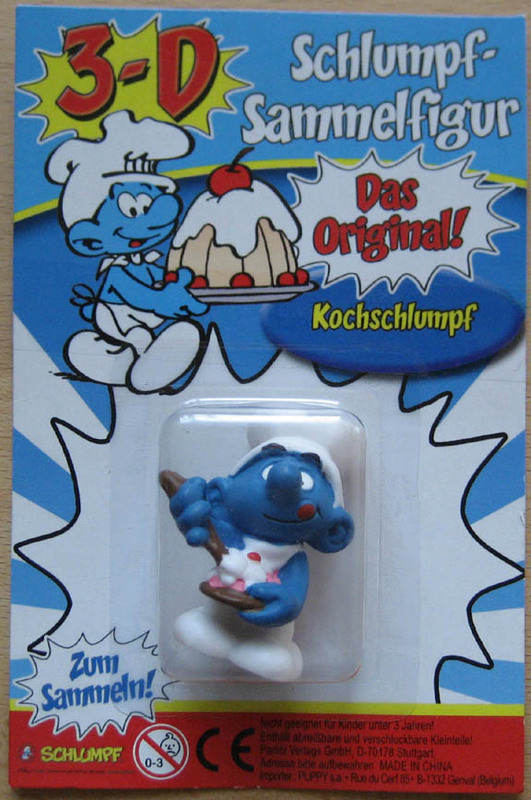 In the Netherlands in 2010, the magazine De Smurfen was sold with Greedy in their first edition. In Australia also in 2010, the cartoon series was repackaged and resold as Just Smurfy 2 DVD Box set with bonus figurine. This was first released around November. Overall, Greedy Smurf is a great one to add to your collection as most people recognise this smurf whether it be from the comics, cartoon series or even from the Smurfs Village mini game. What’s not to like about someone who makes a cake and then eats all for themselves?